Edmund ascended the throne of East Anglia at the age of fifteen, one of several monarchs who ruled various parts of England at that period in her history. The principal source of information about the martyrdom of the young king is an account by Dunstan, who became Archbishop of Canterbury ninety years after Edmund’s death. Dunstan had heard the story many years before from a man who claimed to have been Edmund’s armor bearer. 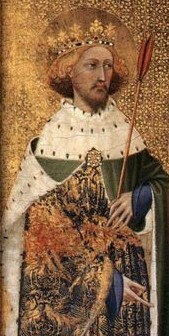 Edmund had reigned as a Christian king for nearly fifteen years when Danish armies invaded England in 870. Led by two brothers, Hinguar and Hubba, the Danes moved south, burning monasteries and churches, plundering and destroying entire villages, and killing hundreds. Upon reaching East Anglia, the brothers confronted Edmund and offered to share their treasure with him if he would acknowledge their supremacy, forbid all practice of the Christian faith, and become a figurehead ruler. Edmund’s bishops advised him to accept the terms and avoid further bloodshed, but the king refused. He declared that he would not forsake Christ by surrendering to pagan rule, nor would he betray his people by consorting with the enemy. Edmund’s small army fought bravely against the Danes, but the king was eventually captured. According to Dunstan’s account, Edmund was tortured, beaten, shot through with arrows, and finally beheaded. By tradition, the date of his death is November 20, 870. The cult of the twenty-nine-year-old martyr grew very rapidly, and his remains were eventually enshrined in a Benedictine monastery in Bedericesworth—now called Bury St. Edmunds. Through the centuries Edmund’s shrine became a traditional place of pilgrimage for England’s kings, who came to pray at the grave of a man who remained steadfast in the Christian faith and loyal to the integrity of the English people. I. O God of ineffable mercy, thou didst give grace and fortitude to blessed Edmund the king to triumph over the enemy of his people by nobly dying for thy Name: Bestow on us thy servants, we beseech thee, the shield of faith, wherewith we may withstand the assaults of our ancient enemy; through Jesus Christ our Redeemer, who liveth and reigneth with thee and the Holy Spirit, one God, now and for ever. Amen. II. O God of ineffable mercy, you gave grace and fortitude to blessed Edmund the king to triumph over the enemy of his people by nobly dying for your Name: Bestow on us your servants the shield of faith with which we can withstand the assaults of our ancient enemy; through Jesus Christ our Redeemer, who lives and reigns with you and the Holy Spirit, one God, now and for ever. Amen. In the collect, it might be good to replace ‘the assaults of our ancient enemy’ with ‘the assaults of the devil’—someone might think it’s referring to the Danes. Though it is correct in the HWHM print edition, the name of our commemorated Holy One today is Edmund, not Endmund. New Hebrew reading: This seems to fit the commemoration, ‘brave soldiers’ and all. 1st sentence: “who ruled various parts of England at that period in her history” – could be consolidated in various ways. In the remainder of paragraph 1, both remaining sentences give the source of the martyrdom information before we are told he was martyred. That’s like putting the footnote in the text but omitting the sentence. My main overriding concern — The whole write-up tells the story ONLY of the martyrdom, not the life. King at age 15, nothing about him prior, then 15 years as king with absolutely no comment. The martyrdom story then kicks in for the grand finale – but of what? I’d like to know there was a “person” who lived a Christian life, who goes with this almost formulaic “noble death” legend. I don’t think this commemoration fits with the genre HWHM follows. I wouldn’t include it this way. Theologically, this supports the spiritualized distortion that earthly life doesn’t matter except as a hazing test for entrance to heaven. It’s nothing short of ironic that the Preface of Baptism is selected for someone about whom nothing illustrating the baptismal covenant is told – except an idealized version of a model martyr’s death. I was hoping the lack of detail in our write-up would be supplemented from elsewhere, but as I read this (from Abbo of Fleury) I still don’t see anything specific. It reads like eulogy, i.e., generalizations — a litany of virtues — but nothing to call biographical data. Thank you for finding it and sharing what was available to find. King Edmund of East Anglia seems to be know primarily for his martyrdom. His death at the hands of the Danes is his only mention in the Anglo-Saxon Chronicle. It is not clear why he is included in the calendar for the Episcopal Church of the United States. More seriously, “a man who remained steadfast in the Christian faith and loyal to the integrity of the English people” is a anachronistic. There were yet no “English people” during his time. Anglo-Saxons, yes. English? not so much. Maybe “shameful vices” is simply an example of stylistic redundancy, like “lift up your hearts” (where can you lift other than up). Lots of redundancy in scripture, also.– I liked the part in Abbo’s paragraph about his being “not puffed up” although a ruler. And the fact that he “restrained the cruel” and didn’t “bend his morality” (plenty of rulers from many times and places who did not restrain the cruel, and did bend their morality–people tend to be grateful to rulers who didn’t). –I think Abbo lived not more than a century later. –Maybe that last line about “loyalty to the integrity of the English people” in the recent bio, however, should have the wording changed, as Cyntha suggests. There is an obvious misprint in both the printed book and the on-line version. there is an extra 2 after the notice Psalm 21:1-7. I assume the “2” belongs with Samuel 1:17-27, which is Daid’s lament for Johothan, which seems a rather long reach for King Edmond the Martyr. Ah, the eagle eye of Dr. Mitchell … the one place it was correct was in the Blue Book for the General Convention 2009 (page 549) Yes, it is 2 Samuel 1: 17-27. The sub-title would be improved if it read “Christian Monarch and Martyr”. Edmund was born in 841: this should be shown. I haven’t found his birthplace: it may be unknown.